On October 31, 1917, in Tsarskoye Selo, a bright new chapter, full of earthly grief and heavenly joy, was opened in the history of sanctity in the Russian Church: the holiness of the New-Martyrs of the twentieth century. The opening of this chapter is linked to the name of the Russian Orthodox shepherd who became one of the first to give his soul for his flock during this twentieth century of fighters against God: Archpriest John Kochurov. Fr. John’s upbringing, being based on the remarkable traditions of many generations of the clergy and bound with the people’s natural following after Orthodox piety, foretold his setting out on the path of preparation for pastoral service. Father John’s study — initially at Danky Theological School and afterwards at Ryazan Theological Seminary — was marked not only with outstanding success in the mastery of theological and secular disciplines, but with remarkable examples of Church piety which he demonstrated during a time when the everyday life of a provincial theological school was not always spotless in the moral sense. The beginning of Fr. John’s parish service was associated with the opening, by Bishop Nicholas, of the Orthodox parish in Chicago in 1892. Assigned in 1895 by order of the Holy Synod to be a parish priest at Saint Vladimir’s Cathedral in Chicago, Fr. John was put in touch with a parish life that was strikingly different from the Orthodox parishes in Russia, which were organized and rooted in a living tradition many centuries old. Being a lonely island of Orthodox Christian life, remotely situated many hundreds of miles from the other scattered Orthodox parishes in North America, Saint Vladimir’s Church in Chicago,5 together with the Church of the Three Hierarchs in the town of Streator with which it was affiliated, in the less than three years of its existence still had not managed to become formed as a parish in the full sense of this word, and it indeed required heroic labors from the young Fr. John to be established in a proper way. The limited financial resources of the Chicago-Streator parish, where the people being ministered to were primarily poor, did not permit Fr. John to begin the construction immediately. And since more than five years had already passed since the time of Fr. John’s arrival in North America, his great desire to visit his beloved Orthodox Russia for at least a brief time prompted him to submit an application to Bishop Tikhon requesting leave for the journey to his motherland. Zealously fulfilling his numerous obligations as a parish priest, he was the only priest there during the first nine years of his service in the parishes of Chicago and Streator. At the same time, Fr. John continued to participate actively in resolving various issues in the life of the North American diocese. In February 1904, Fr. John was assigned as a chairman of the Censor Committee of the Diocese of Alaska and the Aleutians, where he had already participated as a member of the council for seven years.20 In June 1905, he was an active participant in the preparatory meetings of diocesan clergy, held in Old Forge [Pa.] under the guidance of Bishop Tikhon, where issues were discussed in connection with preparation for the first Council in the history of the Diocese of North America and the Aleutians. It was in the solemn atmosphere of the sessions of this Council, on July 20, 1905, that Fr. John’s first decade of priestly service was celebrated, the actual date of the anniversary being August 27. Thus, there began a qualitatively new period in Fr. John’s service: having become one of the most respected archpriests of the Diocese thanks to his outstanding pastoral work in his parish and in diocesan administrative activities, Fr. John, at the initiative of Bishop Tikhon who valued him highly, became more and more deeply involved in resolving the most pressing issues of diocesan administration. In May 1906, Fr. John was appointed dean of the New York area of the Eastern States,23 and in February 1907, he was destined to be one of the most energetic participants of the first North American Orthodox Council in Mayfield, which dealt with the rapidly increasing conversions within the Diocese of North America and the Aleutians in the Russian Orthodox Greek Catholic Church in America, which was the basis on which the Orthodox Church in America was later founded. The common way of life in small, provincial Narva, where the Russian Orthodox inhabitants consisted of scarcely half the population, brought back to Fr. John in some measure the atmosphere familiar to him in America, where he performed his pastoral service in a social environment permeated with heterodox influences. However, the circumstances of his work as a teacher of God’s Law in two secondary schools where the Russian cultural element and Orthodox religious ethos indisputably dominated, permitted Fr. John to feel that he was breathing an atmosphere of Russian Orthodox life reminiscent of his childhood. However, along with undeniable advantages of this new period of the pastoral service of Fr. John, after his return to his fatherland following many years of absence, there still existed a circumstance which could not help but burden the heart of such a genuine parish pastor as Fr. John was for the whole of his life. Being only attached to the Holy Transfiguration Cathedral in Narva, and not being a member of its staff clergy, Fr. John, because of the peculiarity of this situation, on account of his fulfilling his duties as a teacher of Gods Law at the gymnasium, was deprived not only of the chance to lead, but even to participate fully in the parish life of Holy Transfiguration Cathedral in Narva. Only in November of 1916, by order of the Saint Petersburg Church Consistory, was Fr. John assigned as a parish priest to the vacant second position at Saint Katherine’s Cathedral in Tsarskoye Selo,31 whereby his dream of resuming service as a parish pastor in the motherland was fulfilled. Tsarskoye Selo, which had become the remarkable incarnation of a whole epoch in the history of Russian culture, happily combined in itself the qualities of a quiet provincial town with those of the resplendent capital of Saint Petersburg. Saint Katherine’s Cathedral occupied a special place in the town; of the parish churches there, which were predominantly parishes of the imperial court and of the military, it was the largest. In becoming a member of the clergy at Saint Katherine’s Cathedral, and taking up residence there together with his matushka and five children (the oldest son, Vladimir, was at the time fulfilling his military service),32 Fr. John received, at last, his longed-for chance to be immersed fully in the life of a parish priest in one of the most notable churches of the Saint Petersburg diocese. Having been warmly and respectfully received by the flock of Saint Katherine’s, Fr. John, from the first months of his service there, showed himself to be zealous and inspiring not only as a celebrant of the divine service, but also as an eloquent and well-informed preacher, who gathered under the eaves of Saint Katherine’s Cathedral Orthodox Christians from all around the town of Tsarskoye Selo.33 It seemed that so successful a beginning of parish service at Saint Katherine’s Cathedral would open for Fr. John a new period in his priestly service. In this period, Fr. John’s pastoral inspiration and sacrificial demeanor, so characteristic of him in his former activity, might be combined with the daily routine of the outward conditions of his service and with the spiritual and harmonious personal relationships between a diligent pastor and his numerous pious flock. But the cataclysms of the February Revolution that burst out in Petrograd just three months after Fr. John’s assignment to Saint Katherine’s began little by little to involve Tsarskoye Selo in the treacherous vortex of revolutionary events. The soldiers’ riots that had taken place in the military headquarters at Tsarskoye Selo already during the first days of the Revolution, and the imprisonment of the royal family at Alexandrovsky palace over a period of many months, brought the town to the attention of representatives of the most extreme revolutionary elements. These circles had propelled the country toward the path of civil war, and eventually, complete internal political division, the beginnings of which lay in Russia’s participation in the bloodshed of World War I. These developments gradually changed the quiet atmosphere of Tsarskoye Selo, diverting the inhabitants’ attention from the conscientious fulfillment, day by day, of their Christian and civil responsibilities to Church and fatherland. And during all these troubled months the inspiring message of Fr. 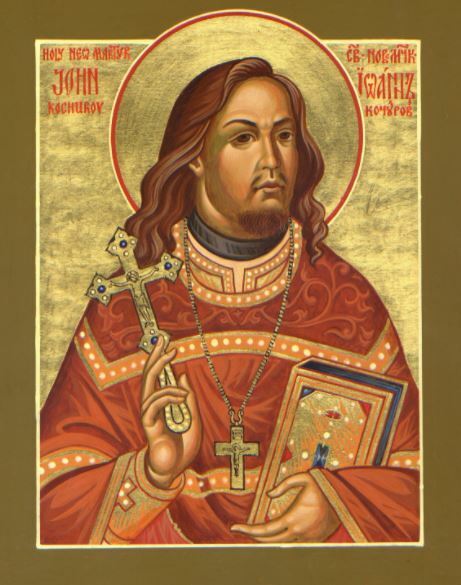 John continued to sound forth from the ambon of Saint Katherine’s Cathedral, as he strove to instill feelings of reconciliation into the souls of the Orthodox Christians of Tsarskoye Selo, calling them to the spiritual perception of their own inner life, so that they might understand the contradictory changes taking place in Russia. The Holy Procession lingered. Twilight changed into darkness. Candles were lit in the hands of the praying people. Everybody was singing. In this manner did Fr. John express his gratitude towards his colleagues and his flock, not suspecting that this very prayer about that brotherhood and friendship would descend on the Russian Orthodox people at a time when love and clemency were scarce in long-suffering Russia — provoking a pitiless hatred towards him from the side of the apostates, who deprived him of his earthly life and snatched away the pectoral cross from his chest, but were not able to rob him of the imperishable glory of Orthodox martyrdom. “Dear brothers,” began the statement by the Petrograd diocesan council, “on October 31 of this year the town of Tsarskoye Selo suffered the martyrdom of one of the good shepherds of the Petrograd diocese, the Archpriest of the local Cathedral, John Alexandrovich Kochurov. Without any blame or justification for this on his part, he was seized in his apartment, conveyed to the suburbs, and was there, in an open field, shot by the possessed mob . . .
“It was with feelings of profound sorrow that the Petrograd diocesan council received this news; the grief has been considerably augmented by the realization that, with the Archpriest’s demise, a large family is left behind, consisting of six members who now are without food, shelter, or any means of subsistence. “God is the Judge of the cunning villains who violently ended the life that was still young. Even if they flee unpunished from trial at the hands of men, they can never elude the judgment of God. But our obligation now is not only to pray for the peace of soul of this innocent sufferer, but with all our sincere love to attempt to treat the deep and incurable wound that has been inflicted on the very hearts of the poor bereaved family. The diocese and the diocesan clergy are directly obligated to provide for the martyred pastors orphaned family, to give them the opportunity to live in material comfort, and to provide the children with a proper education. 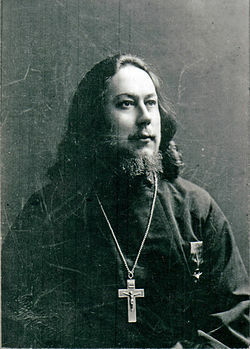 “The diocesan Church council, being moved by the loftiest of sentiments, now appeals to the clergy, parish councils, and all the Orthodox faithful of the diocese of Petrograd with an ardent entreaty, asking most earnestly, for the sake of Christ’s love, that you stretch forth a brotherly helping hand, and by whatever amount you can offer, support a poor family left to be at the mercy of fate. Great is the need, and it should not be delayed! “. . . His martyrdom is, for each of us, a dire reminder, an ominous warning. We therefore must be ready for anything. And to prevent such situations of destitution as we now have, we must prepare, between the times of trial, an assistance fund to be allotted for the defenseless, persecuted, and tormented clergy that in such cases and in similar ones they may have material aid from their kindred in spirit. “. . . Through the deans special lists will be sent to each parish in the diocese for the collection of donations, those that are voluntary and from the Church funds, for help to the family of the deceased Archpriest John Kochurov, and also for the establishment of the special fund for assistance to the clergy in all similar cases. “. . . An immense task requires means commensurate with it. The diocesan Church council hopes that with God’s help such means will be found. The modest offering of the diocese and clergy, made voluntarily and laid on the Christian conscience of each person, will provide an opportunity for drying the tears of the unhappy orphans and for making a beginning of that concern for good brotherly assistance, for which our clergy have a great need particularly now . . .
On one of his regular visits to his diocese during the All-Russian Church Council in Moscow, Metropolitan Benjamin served the Divine Liturgy on November 26, for the patronal feast at Saint Katherine’s Cathedral in Tsarskoye Selo. The Liturgy ended with a fervent exhortation from the hierarch, during which he appealed to the people for unity, love, and brotherhood, wrote a correspondent for the All Russian Church-Social Herald. The Metropolitan also mentioned the terrible event, the assassination of the beloved pastor of the local Church, Fr. 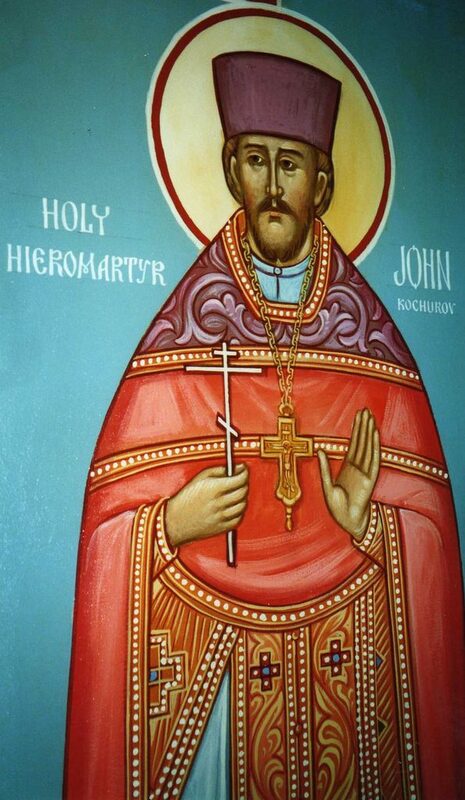 John Kochurov; he noted that though it is a very sad occasion, it has been a cause of reconciliation as well, through the realization that the pastor had laid down his life for love of God and of neighbor, providing an example of martyrdom. The archpastoral message had a strong effect on everyone, and tears were seen on many faces. Following the Liturgy, the Litia for the departed took place at Fr. John’s tomb in the burial-vault of the cathedral. After the service the Metropolitan visited the rectory, where he met the family of the deceased.42 Thus, a second time — and now from the mouth of the diocesan hierarch, who remembered the slain clergyman of his diocese — the Russian Orthodox Church characterized Fr. John’s death as a martyrdom. The Most Holy Patriarch Tikhon had become well acquainted with Fr. John during the many years they worked together in the diocese of North America and the Aleutians, and felt therefore a deep respect for him. Expressing a genuine conviction formed at the Council that the Russian Orthodox Church had gained a new martyr saint in the event of Fr. John’s death, the Patriarch dispatched a letter of sympathy to Alexandra Kochurova, the deceased pastor’s widow: “With great sadness the Most Holy Council of the Russian Orthodox Church has received a report concerning the martyrdom of Father John Alexandrovich Kochurov, who has fallen victim while zealously fulfilling the obligations of his rank,” wrote the future Confessor, the Most Holy Patriarch Tikhon. “Joining our prayers with those of the Holy Council for the repose of the soul of the slain Archpriest John, we share your great grief, and we do that with a special love, because we knew well the deceased Archpriest, and have always held his inspiring and strong pastoral activity in high estimation. “We bear in our hearts the sure hope that the deceased pastor, adorned with the wreath of martyrdom, now stands at the Throne of God among the elect of Christ’s true flock. The holy Council, with earnest sympathy for your bereaved family, has decided to petition the Holy Synod to give you the proper assistance. “May the Lord help you to endure the trial sent to you by the ways of God’s Providence, and preserve you and your children unharmed amid the storms and calamities of our time. 1. The central state historical archive of Saint Petersburg (CSHA of S.-P.), F. 14 University of Petrograd, 3, f.31575, the personal folder of the student Dmitry Alexandrovich Kochurov. 2. CSHA of S.-P., F.19 The Church Consistory of Petrograd, 113, f.4167, the clergy list of the Holy Transfiguration cathedral in Narva from 1908, f.4333; ibid. from 1916, f.4366, the clergy list of the Saint Katherine cathedral in Tsarkoye Selo. 3. CSHA of S.-P., F.139 the Office of the dean of the department of education of Saint Petersburg, 1, f.11305, the annual assessment of the condition of the male gymnasium in Narva from 1908. 4. CSHA of S.-P., F.277 Saint Petersburg Theological Academy, 1, f.3220, the lists of the seminarians come to the examinations in the Saint Petersburg Theological Academy in August of 1891. 5. American Orthodox Messenger (until 1898 The Orthodox American Messenger), 1896, NN1, 7; N14; 1898, N24; 1899, N11; 1900, N10; 1901, N1; 1902, N8; 1904, N5; 1905 N17; 1906, NN10,11; 1907, N14. 6. Vserosiysky Tserkovno-Obschestvenniy Vestynik, 1917, 2 Nov., 5 Nov., 1 Dec., 15 Dec.
7. Pribavleniye k Tserkovnim vedomostyam, 1918, N5-16. 8. Tsarskoselskoye Delo, 1916, 18 Nov.
9. Tserkovniye vedomosty, 1912, N18; 1916, N18-19; 1917, N48-50; 1918, N15-16. 10. Circulars of the Department of Education of Saint Petersburg from 1907. 11. Maltsev, A. The Orthodox Church and Russian establishments abroad (in Russian; Saint Petersburg, 1906). 1The central state historical archive of Saint Petersburg (CSHA of S.-P.), F. 14,3, f. 31575, 1.8, 10. 2CSHA of S.-P., F. 277, 1, f. 3220, par. 1,2,3,4,5,6,8. 3CSHA of S.-P., F. 19, 113, f. 4167, par. 37. 4American Orthodox Messenger (AOM), 1907, N14, p. 269. 5SCHA of S.-P., F. 19, 113, f. 4167, par. 37. 6AOM, 1898, N24, pp. 681-682. 7AOM, 1896, N7, p. 117. 8AOM, 1898, N24, p. 682. 10AOM, 1897, N14, p. 290. 11AOM, 1900, N10, p. 215. 12AOM, 1896, N1, p. 14; CSHA of S.-P., F. 19, 113, f. 4167, par. 38-39. 13AOM, 1898, N24, p. 682. 14AOM 1899, N11, pp. 305-306. 15AOM, 1901, N1, pp. 26, 32. 16AOM, 1902, N8, pp. 171-173. 17A. Maltsev. The Russian Orthodox churches and institutions abroad. Saint Petersburg, 1906, p. 419 (in Russian). 18AOM, 1905, N17, pp. 340-341. 19CSHA of S.-P., F. 19, 113, f. 4167, par. 40. 20AOM, 1904, N5, p. 81. 21AOM, 1905, N17, pp. 340-342. 22AOM, 1906, N10, p. 206. 23AOM, 1906, N11, p. 229. 24AOM, 1907, N14, pp. 269-270. 25CSHA of S.-P., F. 19, 113, f. 4167, par. 37. 26Circular of the Department of Education of Saint Petersburg, from 1907, p. 294. 27CSHA of S.-P., F. 139, 1, f. 11305, par. 28. 28Tserkovniye vedornosty, a newspaper, 1912, N18, p. 128. 29Ibid., 1916, N18-19, p. 167. 30CSHA of S.-P., F. 19, 113, f. 4333, p. 12. 31Tsarskoselskoye Delo, 1916, 18 Nov.
32CSHA of S.-P., F. 19, 113, f. 4366, 1.20. 33Vserosiysky Tserkovno-0bschestvenniy vestnik (VTOV), 1917, 5 Nov.
37AOM, 1905, N17, pp. 340-342. 41Tserkovniye vedomosty, 1917, N48-50. pp. 2-3. 42VT OV, 1917, 1 Dec.
45Pribavleniye k Tserkovnym vedomostyam, 1918, N15-16, p.519.